TazCard, a stand-alone NFC device which communicates via USB and Zigbee instead of a mobile network connection, is set to launch by the end of 2010 with a target price of €150 — and a very different approach to building NFC ecosystems. TazTag’s stand-alone NFC device, the TazCard, is set for commercial launch before the end of this year, CEO Eric Fouchard has told NFC World, with a target price of €150 once the device has entered mass production. 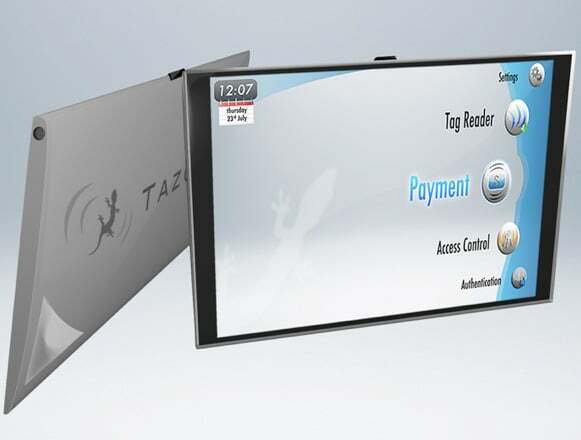 Similar in area to a standard credit card, the TazCard is a Java-based handheld device able to support a wide range of NFC applications including payments, ID, ticketing, loyalty and other services. TazCards feature a 3.5-inch (9cm) touch screen and a biometric fingerprint sensor plus near field communication, USB and ZigBee communications interfaces. TazCards do not, however, include a mobile network interface — although it will be possible to add mobile functionality as an optional extra. Instead, the device uses USB to connect to the internet from a PC, NFC for contactless proximity applications and ZigBee, rather than the mobile internet, to access and download information services and applications in the field. Zigbee is a wireless technology, developed originally to meet the needs of low-cost, low-power wireless machine-to-machine (M2M) networks. Zigbee devices can communicate with each other over a range of up to 30m and can be connected together using mesh networking technology so that multiple Zigbee ‘nodes’, each costing in the region of US$10, can transfer information from one to another over longer distances. In practical terms, this means that the TazTag operates in a similar way to an iPod Touch, which has Wifi and USB interfaces but no mobile connection, rather than an iPhone. It means also that there is no role for a mobile network operator in a TazCard ecosystem — and also that, like the iPod Touch, the TazCard is designed to be a product that consumers purchase as an extra rather than a replacement for an existing device, and for which there’s no need to take out a data plan. How would an NFC ecosystem that does not include a mobile network operator work in practice? A mobile connection is not needed to use an NFC device to make a card transaction, whether that is for a payments, transport ticketing or an access control application, but most tag reading applications do use the mobile networks. Here, when the user reads a tag, typically a hyperlink stored on the tag is transferred to their mobile phone, enabling the user to easily access a website to view information or download a coupon or voucher. And, when a customer signs up for a new NFC service, the mobile connection can also be used to download the application over-the-air to their handset. In both of these applications, the same functionality could be provided by Zigbee, Fouchard explains. For instance, a shop assistant could use a TazCard to read NFC tags on products, then check stock availability, reserve the item for the customer and read his retail loyalty card — all using a store’s Zigbee network rather a mobile network. 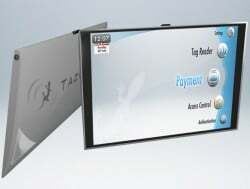 A Java-based software development kit is available now from TazTag and the first TazCards will be available in test quantities from June 2010. The first commercially available devices are due before the end of the year and, Fouchard told NFC World, mass production is expected to begin in 2011. TazTag has also partnered with Sagem Orga and with Inside Contactless on the development of TazCard technology and a prototype device featuring an Inside Contactless Microread NFC controller and a single wire protocol-enabled SIM card, developed by Sagem Orga and running Inside’s Java-based test payment application, has now also been developed. “We believe this device will enable card issuers to provide their customers with a viable NFC bridge — a key success factor towards market adoption of mobile NFC payments,” says Jean-Christophe Tisseuil of Sagem Orga, which is working on a number of innovative solutions for bridging the NFC handset gap. Last year, the company signed a deal with Twinlinx, developer of the MyMax Bluetooth-enabled NFC sticker, under which Sagem Orga will offer MyMax to its customers under its own SIMply Mobile Wallet brand name. And, at the Mobile World Congress in February, the company announced the development of an NFC-enabled key fob containing a WiFi-enabled SIM that could be used to deliver NFC functionality to 100% of today’s mobile phones. “Maybe the market will be first for VIP customers of transportation companies and banks, but I believe that many people will be ready to pay a little to secure their credit cards,” Fouchard concludes.